Smith and Nephew Dermal Wound Cleanser from HealthyKin.com is an over-the-counter, non-toxic, non-irritating, first-aid antiseptic product. It contains the active antimicrobial ingredient Benzethonium Chloride to help prevent bacterial contamination in minor cuts, scrapes and burns. 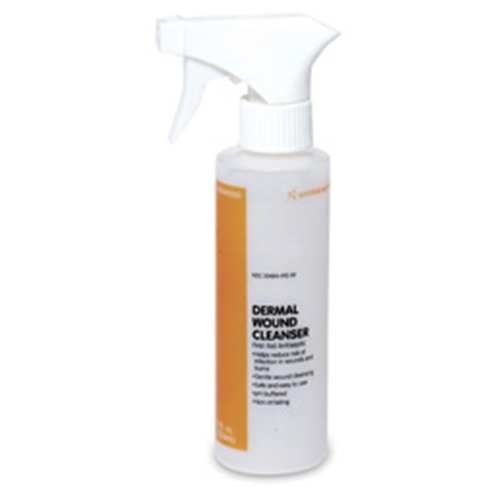 Dermal wound cleanser contains Polysorbate 20, a gentle yet effective surfactant that makes cleansing of the skin and wound quick and easy. It features an adjustable nozzle trigger-spray that allows the caregiver to gently dislodge wound debris and slough with a direct stream or irrigate the wound with the use of a fine mist spray. Smooth and non-stinging spray for cleaning the open wound on the abdomen. Very easy to use but spray setting should be finer if used on skin. Wonderful product, works great. Speedy delivery. Does not sting my skin ulcer, cleans the area great. Quick, efficient delivery. The product is very good for PEG tube site maintenance. Item shipped super fast!!!!!!! I definitely recommend seller to my friends! Fast shipping! Product doesn't sting. I have to deal with periodic wounds due to lower leg vascular insuffiency. I find that this dermal wound cleanser speeds healing unlike alcohol or hydrogen peroxide. It's also affordable and part of the reason I gave this product 5 stars.